Disclosure: I was not financially compensated for this post. I received a gift card to purchase ingredients for this recipe. The opinions are my own, based on my personal experience with the product. One thing I always make sure I have on hand in the fridge is a jar of Hellmann’s mayonnaise. I mostly use it to make sandwiches and dips. Sometimes, I’ll mix a can of tuna with some Hellmann’s and skip the bread altogether. One thing I never thought of though, is using mayonnaise in a dessert recipe! It sounded strange to me at first, but I figured I’d give it a try. All I can say is…WOW! I’ve been missing out all these years. Use Hellmann’s mayonnaise as a replacement for butter and eggs in your cupcake and cake recipes and be in for a treat. Think of it as a secret ingredient to add extra moistness. Plus you’ll be reducing the saturated fat by 5 grams per serving if you want to get really technical about it. This year is Hellmann’s 100th birthday! It’s crazy that they’ve been around that long and still going strong. They are doing something right! They are hands down my go-to brand of mayonnaise. In honour of their birthday celebration, Hellman’s has released some recipes with their delicious spin on some classic favourites. I made these amazing cupcakes! OMG they are soooo good. Moist, sweet and the topping tastes like caramel cheesecake. Seriously you need to try them. Visit Hellmann’s to see more recipe ideas. In addition you can connect with Hellmann’s on Facebook, Instagram and Pinterest. Made with a secret ingredient! The topping tastes like caramel cheesecake. 1. Preheat oven to 350°F and line 24 muffin cups with cupcake liners. 2. In a bowl, whisk together flour, cocoa, baking soda, baking powder and salt. 3. In a mixing bowl, beat the sugar, mayonnaise, buttermilk and vanilla until well blended. 4. Add dry ingredients to the wet ingredients and stir to combine. 5. 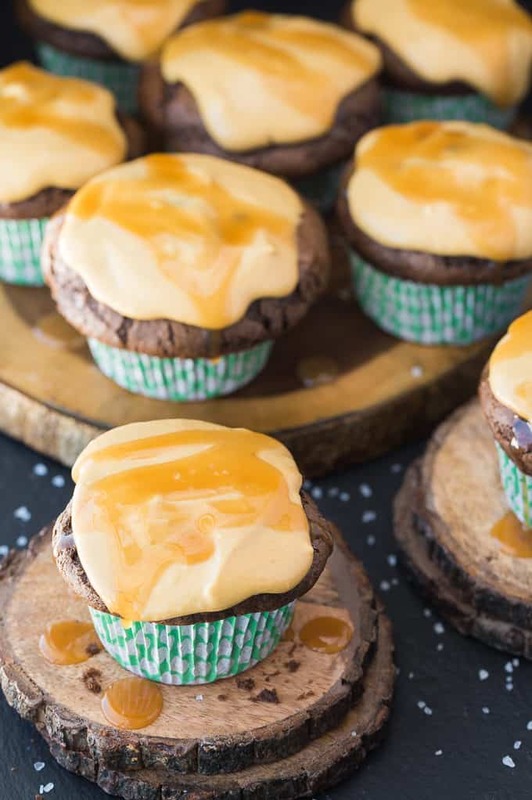 Spread batter into muffin tins and bake for 20 minutes or until a fork inserted into a cupcake comes out clean. Set aside and let cool. 6. To make the topping, stir together sugar and water in a saucepan and cook over medium high heat until mixture turns a deep golden colour (about 12 minutes). Remove from heat. 7. Slowly stir in cream, salt and vanilla and let cool. 8. In a mixing bowl, beat cream cheese until smooth. Then beat in caramel mixture (reserve 1/4 cup for drizzle) until well blended. 9. 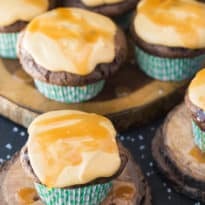 Spread topping over cupcakes and drizzle remaining caramel over each. Refrigerate until ready to serve. Pingback: Enter to Win a KitchenAid Stand Mixer! mmmmmmmmmmm omg those look freakin fabulous!! These look super delicious! I have never heard of mayo in them before! THanks for sharing! These look soooooo good! Do you make the recipe’s yourself? Looks delicious! I will have to try this recipe. Thanks for sharing. 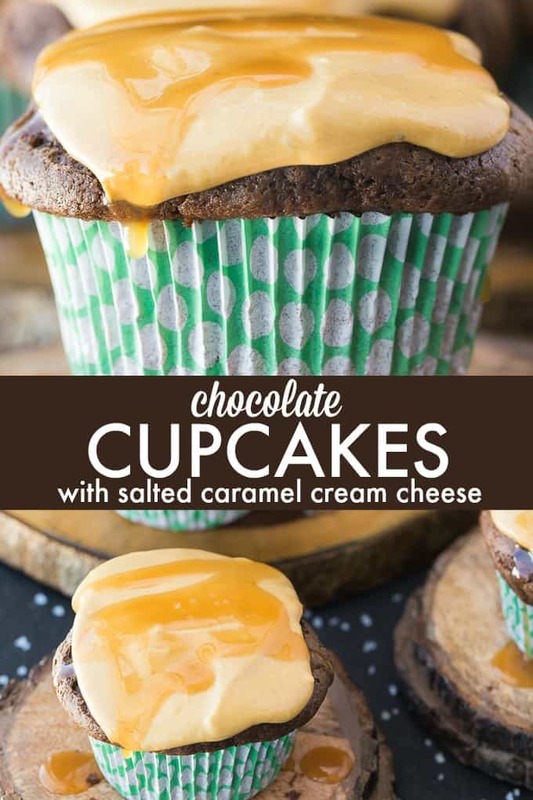 I never would have thought to put mayo in cupcakes! you learn something new every day! Stacie all I can say is wow! These leave me with my mouth hanging open, lacking words, and just wanting to grab one for myself. Thank you for sharing with See Ya in the Gumbo. I’ve picked these little babies to feature at tonight’s party. Yes, please, place those directly into my paws. I also have cupcakes on the brain! Found you via the link party and would love to have you visit my blog and post here: http://www.hellolovelystudio.com/2017/06/come-enjoy-cupcakes-and-cocktails-in-my.html. PEACE TO YOU RIGHT WHERE YOU ARE. pinned at featured on facebook my sweet friend. Yummy hugs! 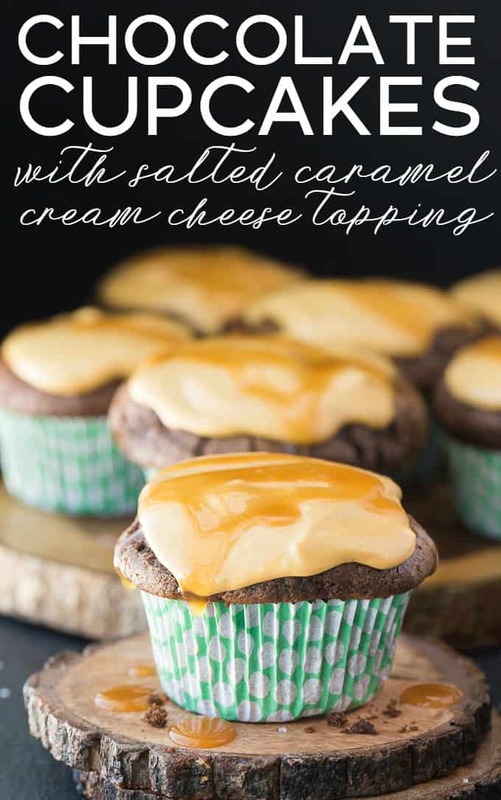 I canonly imagine what a great combination that must be the chocolate and the salted caramel. Yum!